sets the contents of cell in column x, row y to a specified string value, or to NULL if "escaped" is set. sets the contents of cell in column x, row y to a specified value. Render table as serialized text, using the specified style. Render table as serialized text, using a default style. Remove any cached values if used, e.g. Encode a cell value as text using a specified style. Definition at line 56 of file FoldedSheet.h. Definition at line 285 of file DataSheet.h. Definition at line 30 of file RefCount.h. Referenced by coopy::store::PolyBook::attach(), coopy::fold::FoldedCell::FoldedCell(), coopy::fold::FoldedCell::getOrCreateSheet(), coopy::store::PolyBook::operator=(), coopy::store::PolyValue::operator=(), coopy::store::PolySheet::operator=(), coopy::fold::FoldedCell::operator=(), coopy::store::PolyBook::PolyBook(), coopy::store::PolySheet::PolySheet(), coopy::store::PolyValue::PolyValue(), coopy::store::PolySheet::setSchema(), and coopy::store::PolyBook::take(). Reimplemented in coopy::store::PolySheet, coopy::store::remotesql::RemoteSqlSheet, and coopy::store::sqlite::SqliteSheet. Definition at line 156 of file DataSheet.cpp. References coopy::store::RowCache::cells, coopy::store::RowCache::flags, coopy::store::DataSheet::height(), coopy::store::DataSheet::insertRow(), and coopy::store::DataSheet::setCell(). Referenced by coopy::store::PolySheet::applyRowCache(), and coopy::store::CacheSheetRow::flush(). Definition at line 215 of file TypedSheet.h. Reimplemented in coopy::store::PolySheet, and coopy::store::remotesql::RemoteSqlSheet. Definition at line 375 of file DataSheet.h. Definition at line 139 of file DataSheet.h. Reimplemented in coopy::store::CsvSheet, coopy::store::PolySheet, coopy::store::SparseFloatSheet, coopy::store::SparseIntSheet, and coopy::store::SparseByteSheet. Definition at line 264 of file DataSheet.h. Referenced by coopy::store::PolySheet::canResize(), and coopy::store::DataSheet::copyData(). Reimplemented in coopy::store::mdb::AccessSheet, coopy::store::PolySheet, and coopy::store::mdb::JackSheet. Definition at line 262 of file DataSheet.h. Referenced by coopy::store::PolySheet::canWrite(), and coopy::store::DataSheet::copyData(). Definition at line 83 of file TypedSheet.h. Definition at line 79 of file TypedSheet.h. Referenced by cellSummary(), and getNestedSheet(). Definition at line 75 of file FoldedSheet.h. contents of cell in column x, row y, as a string. The "escaped" variable is set to true iff the cell has a NULL value. Definition at line 65 of file FoldedSheet.h. References cellSummary(), coopy::store::SheetCell::escaped, and coopy::store::SheetCell::text. contents of cell in column x, row y, as a string. The value returned by a cell with a NULL value is unspecified. Reimplemented from coopy::store::TypedSheet< FoldedCell >. Definition at line 60 of file FoldedSheet.h. Definition at line 71 of file FoldedSheet.h. Definition at line 26 of file FoldedSheet.cpp. References coopy::fold::FoldedCell::datum, coopy::store::DataSheet::encode(), coopy::store::SheetStyle::setEol(), coopy::store::SheetStyle::setEolAtEof(), and coopy::fold::FoldedCell::sheet. Definition at line 81 of file FoldedSheet.h. References coopy::store::TypedSheet< FoldedCell >::cell(), coopy::fold::FoldedCell::datum, and coopy::fold::FoldedCell::sheet. Definition at line 30 of file TypedSheet.h. in proxies for remote tables. Reimplemented in coopy::store::remotesql::RemoteSqlSheet, and coopy::store::sqlite::SqliteSheet. Definition at line 191 of file DataSheet.h. Definition at line 134 of file DataSheet.cpp. References coopy::store::DataSheet::canResize(), coopy::store::DataSheet::canWrite(), coopy::store::DataSheet::getCell(), coopy::store::DataSheet::height(), coopy::store::DataSheet::resize(), coopy::store::DataSheet::setCell(), and coopy::store::DataSheet::width(). Definition at line 329 of file DataSheet.h. Referenced by coopy::store::PolySheet::dataTail(), and coopy::cmp::Patcher::getSheet(). Definition at line 92 of file TypedSheet.h. Reimplemented in coopy::store::PolySheet, coopy::store::gnumeric::GnumericSheet, coopy::store::remotesql::RemoteSqlSheet, and coopy::store::sqlite::SqliteSheet. Definition at line 230 of file DataSheet.h. Referenced by coopy::store::sqlite::SqliteSheet::deleteData(), and coopy::store::PolySheet::deleteData(). Definition at line 157 of file TypedSheet.h. Reimplemented in coopy::store::PolySheet, coopy::store::gnumeric::GnumericSheet, and coopy::store::socialcalc::SocialCalcSheet. Definition at line 221 of file DataSheet.h. Definition at line 303 of file DataSheet.h. Referenced by coopy::cmp::SheetPatcher::changeRow(), coopy::store::TextBook::copy(), and coopy::store::DataSheet::getHash(). Definition at line 33 of file DataSheet.cpp. References coopy::store::DataSheet::cellSummary(), coopy::store::DataSheet::encodeCell(), coopy::store::SheetStyle::getDelimiter(), coopy::store::SheetStyle::getEol(), coopy::store::DataSheet::getSchema(), coopy::store::SheetSchema::headerHeight(), coopy::store::DataSheet::height(), NULL, coopy::store::SheetStyle::shouldEolAtEof(), coopy::store::SheetStyle::shouldMarkHeader(), and coopy::store::DataSheet::width(). Referenced by blob_show_csv(), cellSummary(), coopy::store::PolySheet::encode(), main(), coopy::store::DataSheet::toString(), and write(). Definition at line 70 of file DataSheet.cpp. References coopy::store::SheetCell::escaped, coopy::store::SheetStyle::getDelimiter(), coopy::store::SheetStyle::getNullToken(), coopy::store::SheetStyle::haveNullToken(), coopy::store::SheetStyle::quoteCollidingText(), coopy::store::SheetStyle::shouldTrimEnd(), and coopy::store::SheetCell::text. Definition at line 383 of file DataSheet.h. Definition at line 246 of file DataSheet.h. Definition at line 242 of file DataSheet.h. Definition at line 148 of file DataSheet.h. Reimplemented in coopy::store::PolySheet, and coopy::store::gnumeric::GnumericSheet. Definition at line 342 of file DataSheet.h. Definition at line 350 of file DataSheet.h. Reimplemented in coopy::store::PolySheet, and coopy::store::sqlite::SqliteSheet. Definition at line 392 of file DataSheet.h. Definition at line 388 of file DataSheet.h. Referenced by coopy::cmp::SheetCompare::compare(), and coopy::store::PolySheet::getDatabase(). Definition at line 222 of file TypedSheet.h. Definition at line 197 of file DataSheet.cpp. References coopy::store::Sha1Generator::add(), coopy::store::DataSheet::cellSummary(), dbg_printf, coopy::store::DataSheet::desc(), coopy::store::SheetCell::escaped, coopy::store::Sha1Generator::finish(), coopy::store::DataSheet::getRawHash(), coopy::store::DataSheet::height(), coopy::store::SheetCell::text, and coopy::store::DataSheet::width(). Referenced by coopy::cmp::SheetCompare::compare(), and coopy::store::PolySheet::getHash(). Definition at line 12 of file DataSheet.cpp. Referenced by coopy::store::PolySheet::getMeta(), and coopy::cmp::Patcher::metaHint(). Definition at line 296 of file DataSheet.h. Referenced by coopy::store::DataSheet::desc(), and coopy::store::PolySheet::getNestedDescription(). Definition at line 88 of file FoldedSheet.h. 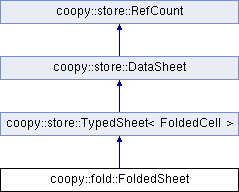 References coopy::store::TypedSheet< FoldedCell >::cell(), and coopy::fold::FoldedCell::sheet. Definition at line 367 of file DataSheet.h. Definition at line 317 of file DataSheet.h. Referenced by coopy::store::DataSheet::getHash(), and coopy::store::PolySheet::getRawHash(). Definition at line 40 of file RefCount.h. Definition at line 346 of file DataSheet.h. Reimplemented in coopy::store::mdb::AccessSheet, coopy::store::CsvSheet, coopy::store::PolySheet, coopy::store::mdb::JackSheet, coopy::store::remotesql::RemoteSqlSheet, and coopy::store::sqlite::SqliteSheet. Definition at line 193 of file DataSheet.h. Referenced by coopy::store::DataSheet::addedHeader(), coopy::cmp::Patcher::addPoolsFromFlags(), coopy::store::DataSheet::encode(), coopy::store::PolySheet::getSchema(), CsvRender::renderHtml(), coopy::store::PolySheet::setRowOffset(), and writePart(). Definition at line 238 of file DataSheet.h. Definition at line 93 of file FoldedSheet.h. Definition at line 358 of file DataSheet.h. Referenced by coopy::store::PolySheet::hasRowOffset(), and coopy::cmp::Patcher::metaHint(). Reimplemented in coopy::store::CsvSheet, and coopy::store::PolySheet. Definition at line 354 of file DataSheet.h. Definition at line 75 of file TypedSheet.h. Definition at line 103 of file TypedSheet.h. Definition at line 117 of file TypedSheet.h. Definition at line 180 of file DataSheet.cpp. References COOPY_ASSERT, coopy::store::DataSheet::insertRowOrdered(), and coopy::store::DataSheet::isSequential(). Referenced by coopy::store::DataSheet::applyRowCache(), and coopy::store::DataSheet::insertRowOrdered(). Definition at line 165 of file TypedSheet.h. Definition at line 190 of file DataSheet.cpp. References COOPY_ASSERT, coopy::store::RowRef::getIndex(), and coopy::store::DataSheet::insertRow(). Referenced by coopy::store::DataSheet::insertRow(), and coopy::store::PolySheet::insertRowOrdered(). Definition at line 334 of file DataSheet.h. Referenced by coopy::cmp::SheetCompare::compare(), coopy::store::DataSheet::insertRow(), and coopy::store::PolySheet::isSequential(). Definition at line 122 of file TypedSheet.h. Definition at line 128 of file TypedSheet.h. Definition at line 182 of file TypedSheet.h. Definition at line 54 of file TypedSheet.h. Definition at line 35 of file RefCount.h. Referenced by coopy::store::PolyBook::clear(), coopy::store::PolyValue::clear(), coopy::store::PolySheet::clearSchema(), coopy::store::PolySheet::clearSheet(), and coopy::store::PolyBook::give(). Definition at line 40 of file TypedSheet.h. Definition at line 35 of file TypedSheet.h. Definition at line 379 of file DataSheet.h. Definition at line 157 of file DataSheet.h. Referenced by coopy::store::DataSheet::applyRowCache(), and coopy::store::DataSheet::copyData(). Definition at line 18 of file DataSheet.cpp. Referenced by coopy::store::PolySheet::setMeta(), and coopy::store::DataSheet::~DataSheet(). Definition at line 362 of file DataSheet.h. Referenced by coopy::store::TextBook::applyPool(), and coopy::store::PolySheet::setPool(). Definition at line 321 of file DataSheet.h. Referenced by coopy::store::sqlite::SqliteSheet::compare(), and coopy::store::PolySheet::tail(). Definition at line 325 of file DataSheet.h. Definition at line 173 of file DataSheet.h. Referenced by coopy::cmp::SheetPatcher::changeColumn(), main(), coopy::store::TextBook::toString(), and coopy::store::socialcalc::SocialCalcTextBook::write(). Definition at line 71 of file TypedSheet.h. Definition at line 22 of file TypedSheet.h. Definition at line 23 of file TypedSheet.h. Definition at line 24 of file TypedSheet.h.